1930 Pavlos Dionysopoulos was born at Philiatra, in the southern Peloponnese. 1949 Pavlos enters the School of Fine Arts in Athens, from which he graduates in 1953. 1954 Thanks to a scholarship from the French State, Pavlos goes to Paris for the first time. 1955 Returning to Greece, Pavlos works in the theatre and advertising. 1958 Pavlos wins a Greek state scholarship for a three-year stay in Paris. 1960 Pavlos takes a studio in the Rue de Vaugirard in Paris. He comes face to face at that time with the works of the Nouveaux Réalistes group, which had just been set up by Pierre Restany. He became friends with some of the members of the group, particularly with Raymond Hains, whom he met in 1961. 1963 Pavlos exhibits a work (affiches massicotées) at the Réalités Nouvelles Salon. 1964 October. Pavlos's first personal exhibition of posters at the Galerie J was the occasion for Claude Riviere, of the Combat newspaper (26 October) to define the former' s position among young artists: "Pavlos, whom we encountered this year in Munich and Venice, presents us with works made of misprinted posters, which, cut up by the massicot, give by their accumulation a material and colour value. Pavlos stresses that posters, presented in profile, are much more expressive than they are when they are presented in flat form, as Rotella does". 1965 In an article in L'Express (4 October) which was highly critical of the Paris Biennale, Otto Hahn referred to the part played in it by Pavlos as one of the rare "clearings" in this "inter-continental journey". His participation was also noted in Le Monde by Michael Contil-Lacoste, who drew attention to the colour effects of an unexpected density. 1966 The strips of paper from the poster, cut up by machinery (massicotées) are from now on folded, suggesting the shape of some everyday object, such as a bunch of flowers, a corset, a sandwich. May. 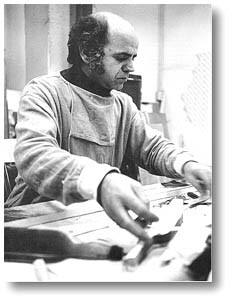 Otto Hahn, in an account of the Paris artistic movement and of the dynamic rise of Mec Art, wrote in Art and Artists: "one of the most poetic spirits among these pioneers is Pavlos, a Greek who lives in Paris and produces his work on the basis of industrial materials, cut-up posters or metal wire". 1968 At his first exhibition at the Ileana Sonnabend gallery, Pavlos exhibited four columns made from massicot paper, reaching from the floor to the ceiling, and the curtains which completely covered the surface of the walls on which they were exhibited. 1971 February. Exhibition of Pavlos at the Galerie Sonnabend, Paris, France. 1972 March. Pavlos's first retrospective exhibition is held at the Kunstverein, Hanover. July. On the occasion of the opening of Pavlos's retrospective exhibition at the Kunstverein in Hamburg, Manfred de la Motte delivers the inaugural address. This is followed by a concert by Hans-Christian von Dadelsen for 59 birds with a woodland accompaniment. November. Invited together with James Rosenquist, Soto, P.O. Hultvedt and other artists, Pavlos presents his wood at the Paris Festival in the Grand Palais. 1973 March. On the occasion of the "Still Lifes" exhibition at the Galerie Iolas, Pierre Faveton publishes an important article in the periodical Connaissance des Arts. 1974 March. The Marzona gallery in Bielefeld shows a new collection of "Still Lifes". August. On the harbour at Hydra, Pavlos, dressed in a frock-coat and holding a shoeblack' s box, undertakes to polish the shoes of tourists. 1979 April. Vogue photographs its models in front of sculptures by Takis and Pavlos. 1980 Greece devotes the whole of its pavilion at the Venice Biennale to Pavlos, who produces an installation of his latest works in bolduc. 1985 When the institution of Cultural Capitals of Europe is inaugurated in Athens, Pavlos holds an exhibition of flags of the Community at the Pierides Gallery. Jana Markova makes a 30-minute film in Athens, Philiatra and Paris on the subject of Pavlos and his works for German ZDF television. 1988 After the first period of abstraction, which was followed by a period devoted to the object, we now have the conquest of nature. Plants. Water. The torn paper is the waves. The paper, in fine strips, is grass. These have been an opportunity for Pavlos. An opportunity to show that by means of any material, the inborn nature of the colourist is inevitably revealed. Pavlos, the colourist is inevitably revealed. Pavlos, the colourist, after a long journey, has at last accepted this identity. 1991 October. The Galerie Guy Pieters holds a personal exhibition of Pavlos in the context of the FIAC which is received with great ethusiasm by the public. 1992 September. The city of Paris holds a small retrospective exhibition of Pavlos in the chapel of the Sorbonne entitled "Thirty Years of Paper". 1996 One man show: "Ploes EE", "In Another Reality", the Petros and Marika Kydoniefs Foundation, Andros, Greece. 1997 The J.F. Costopoulos Foundation organises the first retrospective exhibition of Pavlos in Greece. May - August: The exhibition opens at the Macedonian Museum of Modern Art, in Thessaloniki, in the context of the European Cultural Capital, Thessaloniki '97. October - December: The exhibition travels to Athens, at "the Factory", Athens School of Fine Arts..